Paradise Found... a Reel and Diver Retreat! Come to the Islands of Florida...the Keys! This fabulous home has a wonderful view of Summerland Key and the Atlantic Ocean with over 85 feet for your boat on a secure deep water canal. Only 6 miles to Looe Key National Marine Sanctuary or the back country through Kemp channel, your fishing and diving adventures await. Whatever your dreams, this spacious home provides a tropical island getaway that will surpass your expectations. A kayak is provided for exploration of the nearby islands as well as a large area for sunbathing and relaxation. Only 30 minutes to Key West and the international experience of the Conch Republic with gourmet dining and shopping awaiting. Wonderful local shops and restaurants are available for easy living. In the cooler months, a heated pool will be just perfect before your cocktails on the large balcony overlooking a lagoon of egrets and herons. Whatever your dreams, you will find them here! Our home is uniquely positioned so that the renter can easily go to the Atlantic or the Florida Bay without a long no wake zone. Plus our home doesn't have a view of another's back yard...get to see a nice lagoon! Any renter that has a 2 week stay or longer will have an opportunity to use our Bahamas Condo in fabulous South Bimini for only the cost the utilities and cleaning. The available times are variable since we rent that property as well. Bimini has pristine waters with a major casino on north Bimini. On a wide, beautiful lagoon with an openwater view. quiet island type setting that will make your stay memorable! We have rented this home annually for our Spring vacation for over 7 years now and absolutely love the set up of the house. The location is perfect for offshore backcountry fishing. The canals in the area are clean and dockage behind the house is spacious to tie up your boat. The pool which is located under the second flow of the home provides excellent shade for hot sunny days. The downstairs "garage" with refrigerator/freezer and bait freezer makes is very convenient for storing and locking up fishing gear. The home interior is wonderful and clean and well maintained. All kitchen amenities and linens provided. The community of Summerland Cove is a nice area for bike riding and walking. The bay is beautiful for watching sunsets. Very peaceful clean neighborhood. 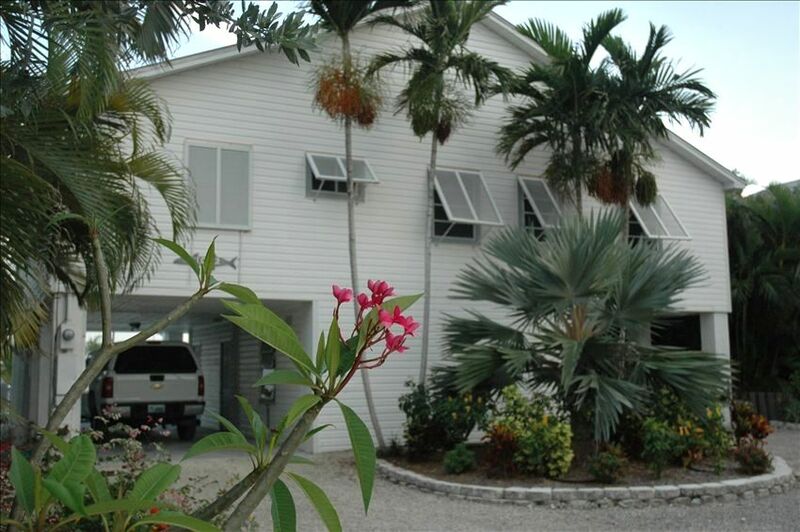 The house is conveniently located to good restaurants and approximately 30 minutes car drive to Key West and Marathon. We love the home and look forward to continue renting each year. Happy to know Hurricane Irma did not destroy the home! This home ticked all of our boxes and did not disappoint. The boat and kayak access to the canal plus the pool allowed plenty of opportunities for enjoyed water activities. Small craft advisories for part of our stay kept us from going out but we either headed down to Key West or just relaxed on the balcony enjoying the comfortable breezes. The fully stocked, clean property felt like home after a couple of days and we hated to leave. The owner was helpful and accommodating. He hope to visit again! This home was just what we were looking for. It is located on a canal that opens out into a lagoon, which opens out to the ocean. It was very quiet and peaceful. We had awesome lizards that could be seen out sunning themselves and birds a plenty, I'm am avid birdwatcher so this was an extra bonus. The home was well appointed, comfortable and was clean other than some stains on the master bedroom carpet. You could tell the home was well taken care of. The house is laid out well and I found everything I needed in the kitchen. My kids enjoyed playing in the pool and we felt like we were in paradise sitting out on the deck. We did have dinner at Boondocks twice (a local bar/grill, suitable for families), one night they had a live band and the other night we played a round of putt putt golf. We had good service and good food.We enjoyed our stay at Tom's home and I wouldn't hesitate to stay at his home again if we ever find ourselves in the Keys again. Thank you! Having stayed in various florida keys locations over the years we recently stayed here and enjoyed it tremendously. The location, layout, amenities, boating access and tranquility definitely fit our needs. Owner Thomas was great, and easy to deal with and I look forward to repeating our vacation here. We had spent the last 20+ years in Florida Keys vacation homes and have settles on this home the last 5 years. There are so many wonderful amenities, from the spacious island style home with magnificent views to the delight full partially shaded pool that is much appreciated with the Florida Keys sun to the quick access to excellent fishing and diving in bother the Atlantic as well as the Gulf waters to the close proximity of Key West. (Approximately 25 mins). This home has everything you need for a memorable stay that will keep you coming back for many years to come! Our family recently stayed in "Paradise Found" and thoroughly enjoyed ourselves. The floorplan was great as it allowed for our son to be put to sleep while we closed off the hallway leading to his room so that we could stay up for the remainder of the night and cook a nice meal or simply relax not bothering him. My wife and I are "foodies" and the kitchen was stocked with all of the right amenities to cook a nice meal. The upstairs balcony was very large and enabled us to open up the triple slider sliding glass doors and use the balcony as a extension to the home when the weather was cool enough to do so. Both the balcony and the patio below enabled us to see all the boats coming and going on their excursions. The house is positioned on the canal towards the entry into the neighborhood so 95% of the boats that left the neighborhood had to pass by our house which our 2yr old son loved. Of course this is a now wake zone so we could chat with the boaters as well. The pool was perfect however we didn't realize that it was heated. Had we known that, we would have made it a bit warmer so that my wife could enjoy the pool. As it stands, only my son and I swam in the pool. The neighborhood was quiet and full of nice people. We interacted with them as we rode our bikes throughout the subdivision. We biked it to a nearby coffee shop for a light lunch and also to the local Pizza restaurant at the front of the subdivision. The coffee shop was good but the Slice of Paradise Pizza restaurant was OK. The Square Grouper on Cudjoe Key to the South was phenominal. Bahia Honda State park is a nice beach that we frequented and it's about 20 minutes to the north. We were also able to bring our two dogs which was nice. They thoroughly enjoyed being on vacation with us and the fenced in area downstairs gave them free reign outside without any worries to us. The property was well maintained but could probably use a very deep cleaning. The house was clean upon our arrival but probably just needs to get the annual deep cleaning done fairly soon. My wife has high standards for cleanliness so she is probably ultra-sensitive in this area. Overall, the place is excellent and we would highly recommend it. We hope to return some day. The owner was very helpful. Great Job!